Indonesia (MNN) — In terms of persecution, Indonesia has been a little less hostile to non-Muslim faiths… at least until this year. FMI’s Bruce Allen says Christians in Indonesia have been experiencing increasing pressures from society. There has been an increase of radical Islam in Indonesia, particularly in specific cities. Some mosque leadership has also become increasingly more radicalized and militaristic too. This mindset is being passed down to Muslim worshipers. “The attacks this year were the most severe against churches in Indonesia (which is the world’s most populous Muslim majority country) in nearly two decades. Even the government is recognizing the increased threat to Christians and saying we want to protect these citizens,” Allen explains. The government is providing police and military forces as guards for security at some churches across Java. However, it can be as little as two guardsmen at a church because of the lack of manpower compared to the need. Allen says this policing or guarding has been going on since May. Allen says FMI Indonesian partners share that these guards are not in uniform. Instead, they’re in everyday clothes to keep them from standing out in the crowd. While FMI’s church leadership appreciates the added security, the fact that these precautions are necessary has some congregation members uneasy about attending church. “Even though physical protection is increasing, you may also be increasing that emotional factor in some of the parishioners going, ‘Do I want to go to church. Is it really dangerous for me to get there?’,” Allen explains. But, besides Sundays, the police are unable to be present on days when other ministry is conducted. This means there are increased risks when it comes to baptism services, prayer meetings, and other ministry related events. FMI’s Indonesian partners are now seriously considering adding extra security measures to their churches. This could mean adding external walls, alternative power sources, and other possibilities. However, this also adds an unexpected expense for these churches. Still, the rise in pressures from society is not stopping ministry. And it’s something the global Church should be encouraged by and attempt to imitate. On a similar note, this situation is cause for concern for FMI’s upcoming conferences in the country. FMI has changed its conference venue to a more secure location because of the increased security concern. “We’ll be looking at Christian apologetics and how to engage non-Christians for evangelistic conversations and how to respond to the needs of non-Christians. And so, we’re very much talking about the impact that the Christians have in the wider community. They wanted to make sure that as we are discussing the relations that they have with the Muslim majority, as well as other minorities in the country, that we are doing that in a very secure location,” Allen explains. This has also added additional expenses to the conferences. Allen says FMI wants to do this, regardless of costs. 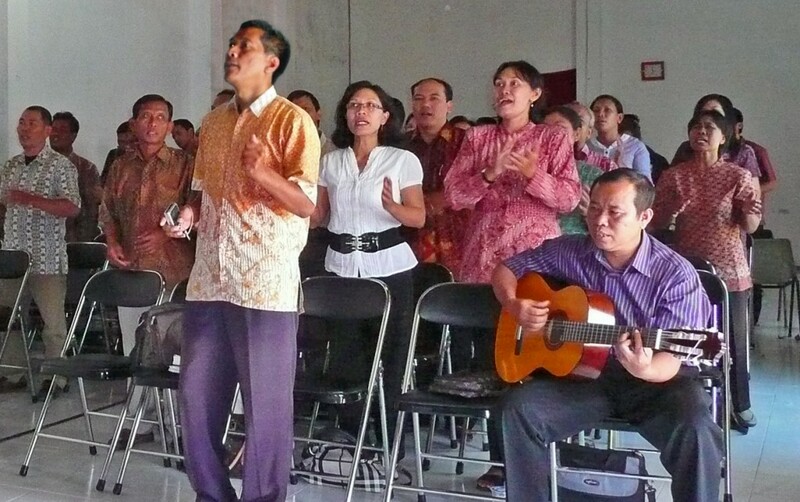 The Indonesian church planters are doing their work well and FMI wants to continue encouraging and training them. In fact, FMI’s annual conferences are a time of refreshment for these pastors and church planters.